The longer you go, the bigger the divide between sports when it comes to fueling them. 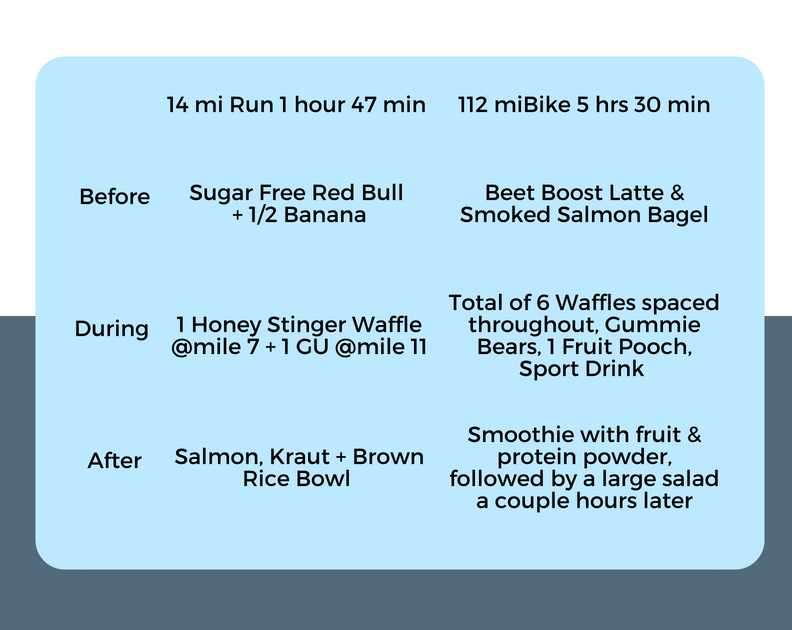 This week I completed both a long run (14 miles) and long ride (112miles) and it got me thinking of how I was eating for each and how different that was. Here is a look at how I fueled these two endurance training sessions with some reasoning behind my choices. The gut is stable on the bike, especially an endurance ride, so more food can be consumed before starting. Running is best tolerated with a less full stomach. Both events benefit from evenly spaced fueling as the burn is roughly the same ~500cal/hr. Since the bike is much longer, more fuel is needed and the food can be more whole, less pure sugar. Less food consumed during the run means more is needed after. With the bike, more food consumed during means a nutritious smoothie will take care of immediate recovery needs. Having a balanced bowl a bit later will take care of hunger and return the body to healthful, non-sport eating.